Samsung today announced that its 2019 TV lineup with QLED 4K and 8K options, can now be pre-ordered or purchased from the Samsung website or from select retailers across the United States. Available in sizes ranging from 43 inches to 98 inches, the QLED lineup works with AirPlay 2, thanks to Apple's move to expand <!---->AirPlay<!----> 2 availability to many television manufacturers. <!---->AirPlay<!----> 2 will allow Apple users to stream music, podcasts, and more directly to Samsung TVs. Samsung's 2019 TVs will also feature a new iTunes Movies and TV Shows app, allowing iTunes content like movies and TV shows to be accessed directly on a Samsung television set. Existing 2018 smart Samsung TV sets will also get <!---->AirPlay<!----> 2 support and the iTunes app through an upcoming firmware update. Samsung plans to debut the new iTunes Movies and TV Shows app in more than 100 countries, while <!---->AirPlay<!----> 2 support is set to be available in 190 countries, but specific timing has not yet been announced. Samsung's 2019 TV lineup includes Q60, Q70, Q80, and Q90 sets ranging in size from 43 to 82 inches, along with the QLED 8K, available in sizes ranging from 65 inches to 98 inches. Samsung's QLED Lifestyle 4K TVs in sizes ranging from 43 to 55 inches are also launching, as are new 4K UHD RU TV sets in sizes ranging from 43 to 82 inches. According to Samsung and Apple, all 2018 and 2019 4 Series, 5 Series, 6 Series, 7 Series, 8 Series, and QLED Series TVs will work with <!---->AirPlay<!----> 2, and presumably, those television sets will also get the iTunes app. Other smart TVs with <!---->AirPlay<!----> 2 support will also work with HomeKit, but Samsung's televisions will not feature HomeKit integration and will not be listed in the Home app. 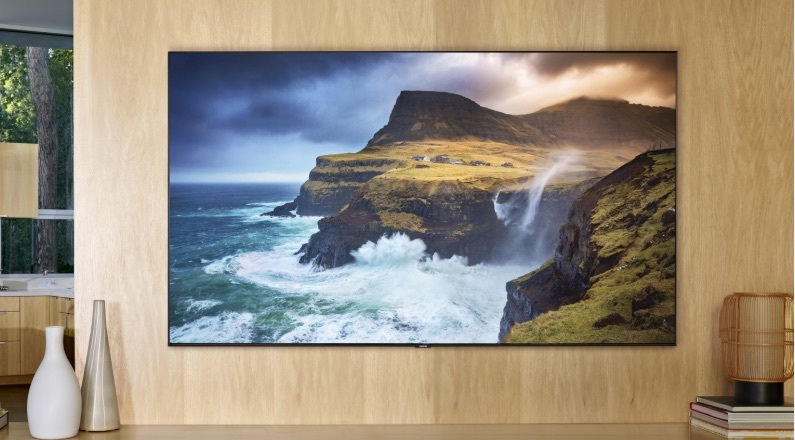 Samsung has its 65-inch Q900 QLED 8K TV available for purchase from its website starting at $5000 for 65 inches. The TV sets will ship by March 1, 2019. Many of the other 2019 television sets are not available for purchase on Samsung's site but should soon be showing up on websites for various retailers like Best Buy, B&amp;H Photo, Amazon, and others.